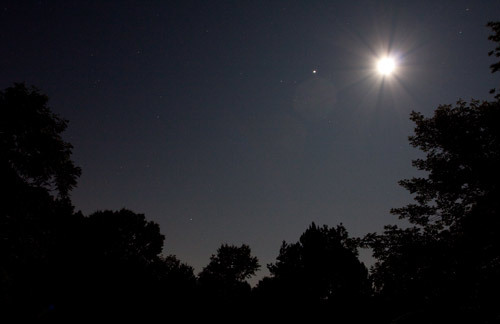 The first week of September saw Earth's Moon and Jupiter in a slow nightly dance across the sky. At first Jupiter trailed the waxing Moon; the week ended with Jove leading. This picture was shot the night of September 1 from the Observatory's back yard. Light just above the trees is light pollution from a nearby small town. I took similar photos from our back deck – but nothing turned out as well as yours!